The monitoring solution allows you to control your infrastructure and information systems. The solution is intended to monitor the operating status of the materials or technical equipment. The company CLEVER Technologies offers IT monitoring solution with alarm management, periodic penalty payments, to manage and supervise the technical alarms, computer, industrial, crisis situations, alert systems.MEMOGuard, SaaS monitoring solution, (or on site), supports all alarms and alerts, including those related to the computer system. The MEMOGuard software hypervision solution, will then manage these alerts and messages to trigger crisis plans, actions to be based on a predefined schedule. The supervisor can manage and supervise based on-call schedules, persons on duty, and / or on-call alarms. It is possible to define procedures with MEMOGuard, which are triggered when an alert is raised. 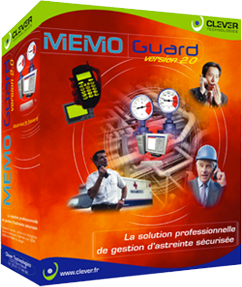 The monitoring solution, MEMOGuard, allows sending SMS alerts, email, pager, fax, radio 5 ton, TCP frame. With MEMOGuard, complete supervision system, you master the chance. Pilot and oversee its Information System . for back alarms via alert messages (via email, pager, sound, SMS, vocalized). As technology advances, the more tools for the establishment of crisis centers are a necessity for IT Directors and production line managers, or simply controllers or directors of security. The monitoring software ensures the proper functioning of infrastructure and equipment, either in the world, for the supervision of industrial production lines, computer with supervision of IS (information systems) – or the supervision of Technical Management centralized , building “GTC – GTB” Supervision of fire safety systems, machine controllers Supervision. MEMOGuard is the monitoring solution of all alarms and alerts management with standby, MEMOGuard has a web interface Man Machine “HMI alarm management” for the visualization and management of alert messages for accessible web interface with all web browsers and / or mobile. The alarm messages deferral solution allows following the detection of an alarm, to transmit specific messages to all those periodic penalty payments via the Mobile Telephone Network (GSM) and others such as pager paging. « Monitoring Supervision : Control and monitor all systems.